Citation Information: JCI Insight. 2018;3(18):e99911. https://doi.org/10.1172/jci.insight.99911. Comparative models of wound healing and tumor stroma. (A) The first phase of wound healing involves hemostasis; platelets form clot at the injury site, which transforms to fibrin. Fibrin, vitronectin, and fibronectin form early matrix. Neutrophils migrate to the wound and cytokines are released. Fibroblasts are recruited to the wound. (B) During the proliferation phase of wound healing, macrophages are recruited to clear dead tissue and debris. 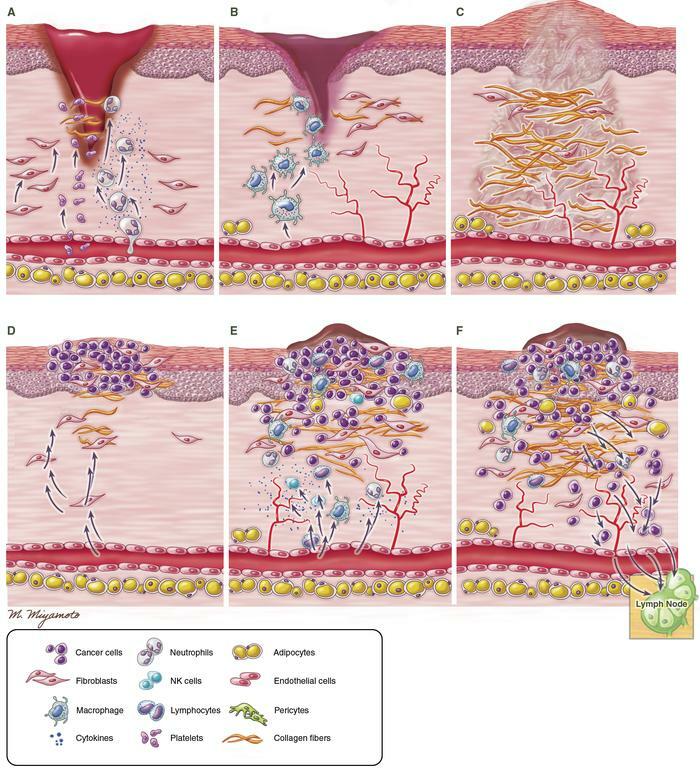 Keratinocytes migrate to cover the superficial wound area. New blood vessels form in the wound bed. Fibroblasts are activated in the wound and begin to deposit new ECM. (C) During the remodeling phase of wound healing, wound contraction occurs, collagen III is replaced by collagen I, and the ECM is remodeled by proteases and other enzymes. Nerve regeneration progresses and new vessels are pruned. (D) When neoplasia is first initiated, fibroblasts are recruited to the tumor site, activated, and incorporated. Production of dysregulated ECM proteins and proteases is stimulated, forming a scaffold for tumor proliferation. (E) As the tumor grows, the epithelium can be eroded away by cells expanding from below, causing ulceration at the skin edge of the tumor. VEGF and other signaling molecules induce neovascularization. Inflammatory cells are recruited to the TME and release cytokines. CAFs can adapt to tolerate and even participate in many of these features. Adipose cells also form a component of the tumor stroma. (F) The abnormal ECM is protumorigenic and proangiogenic. The tumor vasculature is leaky, which can allow metastases to distant sites. Tumor cells are also cleared by lymphatics and can permit lymphatic metastases. Illustrated by Mao Miyamoto.